On Sunday morning, Omar Mateen took an AR-15 assault rifle and a pistol to Pulse at 2 a.m. and exchanged gunfire with a police officer outside. He then entered the club, opened fire on the people inside, and then took hostages. Fifty people were killed and 53 more were injured; many of them escaped through various exits and got to safety. At roughly 5 a.m., the SWAT team stormed the building, and Mateen was killed in a gunfight. We’re all stunned. My Facebook feed has been flooded with shock, anger, tears. Prayers and messages of support are coming from friends all over the country. Vigils are being planned in Orlando, although law enforcement is requesting they be rescheduled. One was held last night, and more are scheduled for tonight. Even more vigils were held around the country — Louisville, Indianapolis, New York, Atlanta, Denver, Austin, Las Vegas. As in Pennsylvania. Allentown, Pennsylvania. A city of 118,000 people held a vigil for my city, 1,038 miles away. That’s some wonderful support. 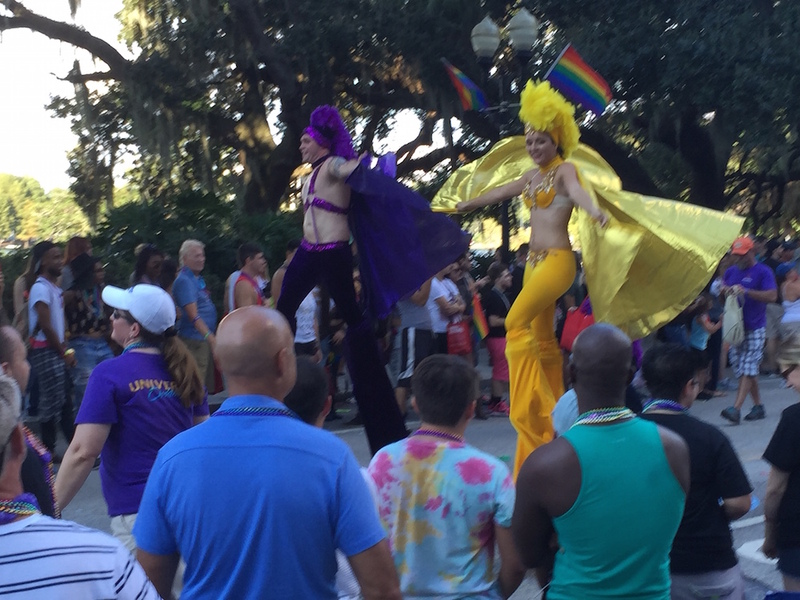 Stilt walkers from the 2015 Pride Parade. Pleas for blood donations turned into long lines. Followed by more pleas from the blood centers to stop coming, because they had too much, and the lines stretched for blocks. One of my first weekends here, my good friend, Clay Rivers, invited me to the Orlando Gay Pride parade. I had always promised myself I would go to Indy’s Pride parade, but never had the chance. Since I know many gay people, including Clay, I wanted to be supportive. It was a great time. I got to see how Orlando supported its gay citizens, and I was never more proud to be an ally of the LGBT community. Except now the worst has happened in this open and supportive city: someone, fueled by intolerance, bought an assault rifle despite being on a terror watchlist, killed 50 people, and wounded 53 more. Here, just a few miles from where I live and work. Here, where my friends live and work. Here, where I’ve become part of different communities. That made it personal. I may forever be a misplaced Hoosier living in the wrong state, but Orlando is My City, and I’ll stand with them. Phenomenal! Well stated, obviously heartfelt, and right on the money!! Well done, my friend, well done!! !